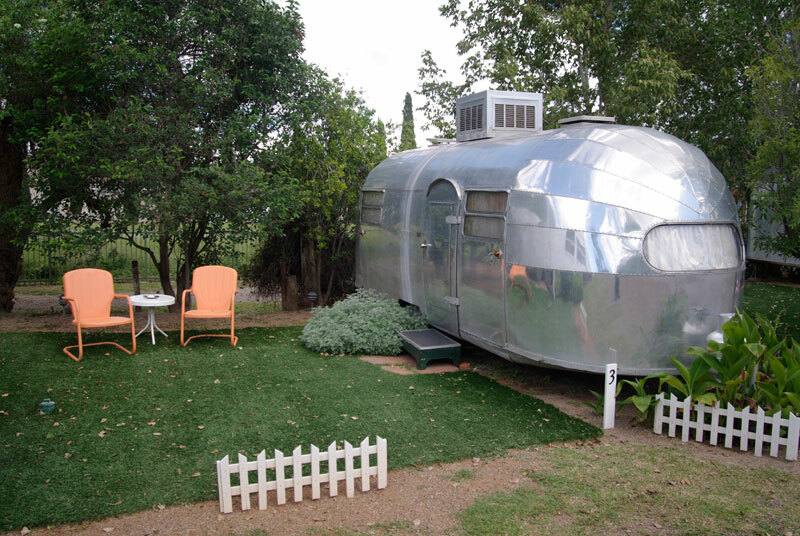 A 1955 Airstream is one of the vintage mobile homes visitors can bed down in at the Shady Dell Trailer Park in Bisbee, Arizona, where the radios play 1950s songs and ads, and the TVs show old movies like The Long Trailer . WHEN ITS COPPER mine shut down in 1974 much of Bisbee’s population left and property prices plummeted. Over the following decades the small town gradually re-invented itself as an artists’ colony and tourist destination, repopulated by immigrants from all over the United States. Among them were antiques-and-collectibles dealers Ed Smith and Rita Personett, who had been acquiring unwanted 1950s travel trailers. In 1994 they bought three in quick succession and needed a place to park them. Smith found out that the oldest continually operating trailer park in Arizona, an antique in itself, was on the market. Shady Dell had started life in 1929 and had had the same careful owner until the 1950s, after which it changed hands rapidly several times and fell into disrepair. The aim was to create a living museum of the 1950s, offering everything that would have been found in a trailer park of that period. The business had hardly started when Smith’s phone began to ring nonstop. The calls were not only from potential guests, but also from trailer owners looking to sell or give away the once-loved, now superannuated vehicles cluttering their driveways. The current accommodation consists of 10 trailers, from tiny, three-metre-long bubbles of aluminum to mansions on wheels over 10 metres in length, all sitting on Astroturf lawns adorned with lime-green or orange garden chairs and pink plastic flamingoes. The interiors of some of the trailers are equally as gaudy, decorated with the brightly coloured vinyl surfaces and leopard-print fabrics popular at the time. A 1951 Spartan Mansion, with a front that leans forward into the airstream, comes equipped with a tiny toilet and kitchen in a largely birch-wood interior. On the kitchen table a push-button radio with the fashionable, if pointless, streamlining of the period plays a medley of ’50s tunes interspersed with sober and earnest advertising for now long-forgotten products and services. A double bed with chenille bedspread fills one end, and the lounge at the other has an original record player with old vinyl recordings of Bill Haley and a very young Frank Sinatra. A small, ancient black-and-white television is cleverly connected to a state-of-the-art DVD player hidden away in a cupboard with a stack of DVDs such as the highly appropriate Lucille Ball and Desi Arnaz vehicle The Long Trailer . Few hotel rooms have such built-in coziness, and as the darkness falls outside and with the curtains closed, Best of Mancini on the turntable and a 1955 copy of Life magazine to flick through, there’s nothing to disturb the sense of time travel. For more information on the Shady Dell visit its website at www.theshadydell.com. For information on travel in Arizona visit the Arizona Office of Tourism website at www.visitarizona.com.